On Friday, Sept. 15, a judge in St. Louis found Jason Stockley, a white former St. Louis police officer, not guilty of first-degree murder in the death of a black man named Anthony Lamar Smith. Smith was shot and killed by Stockley after a high-speed chase in 2011. Demonstrators have been marching throughout the city, and some suburban areas, every day since the verdict announcement. Today is Sunday, Oct. 1. 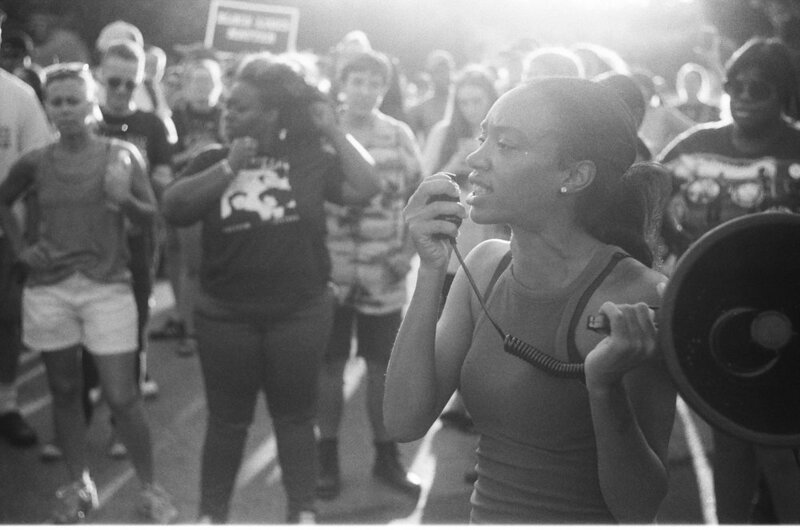 View a list of what protestors want to change post-Stockley verdict, and learn why following through won't be easy. Context for the shooting and the trial can be found here. A breakdown of the judge's decision, made without a jury, can be found here. A more detailed description of the protests can be found here. 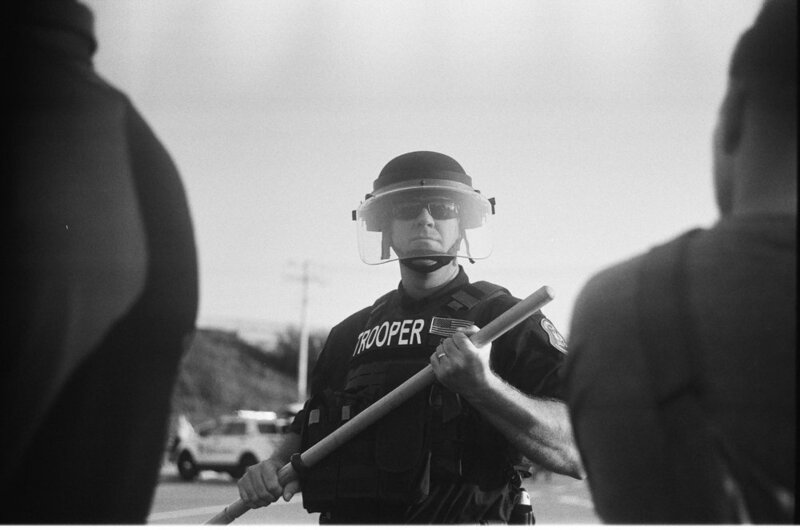 A police officer in protective gear holds a club in St. Louis. 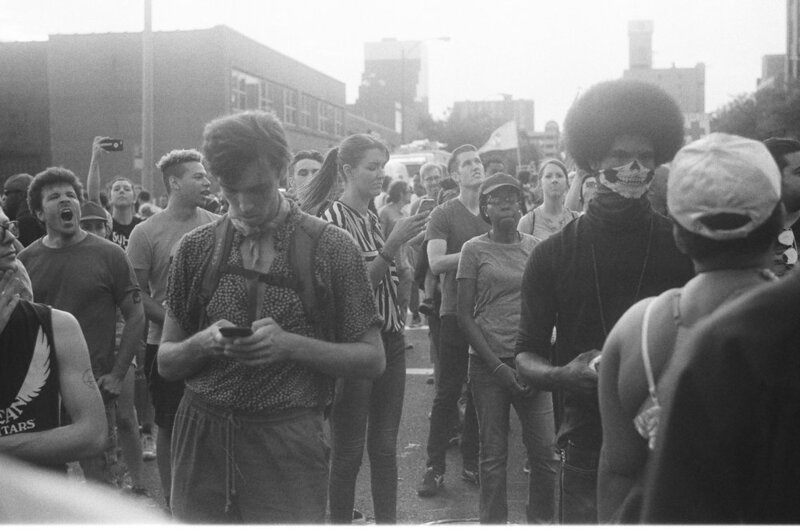 The photographer shoots on film only. View his first gallery of the protests a week earlier here. 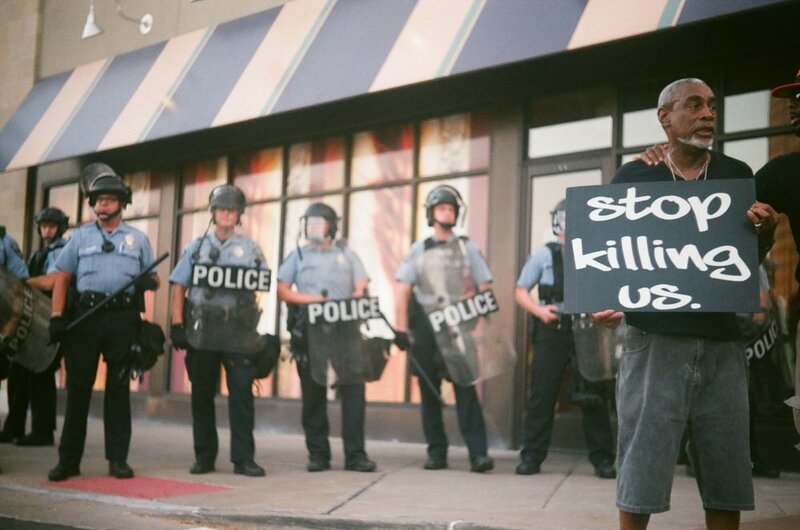 A protester stands in front of police officers. 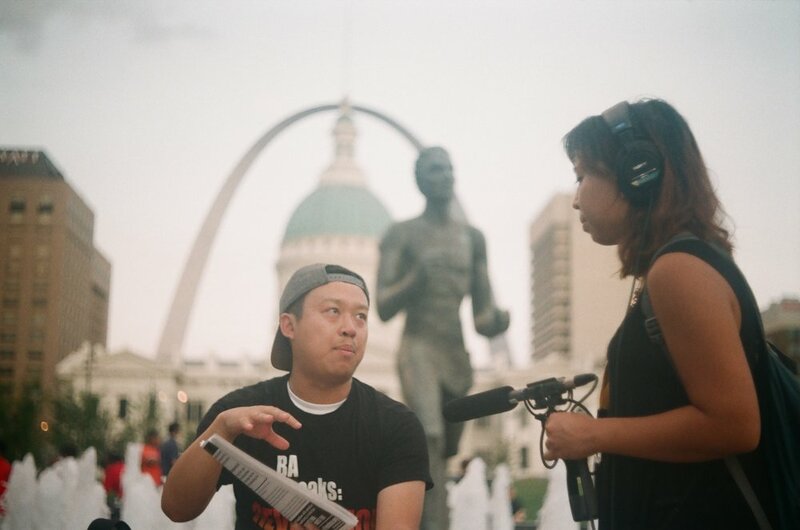 A man from Chicago is interviewed before a gathering in Kiener Plaza. 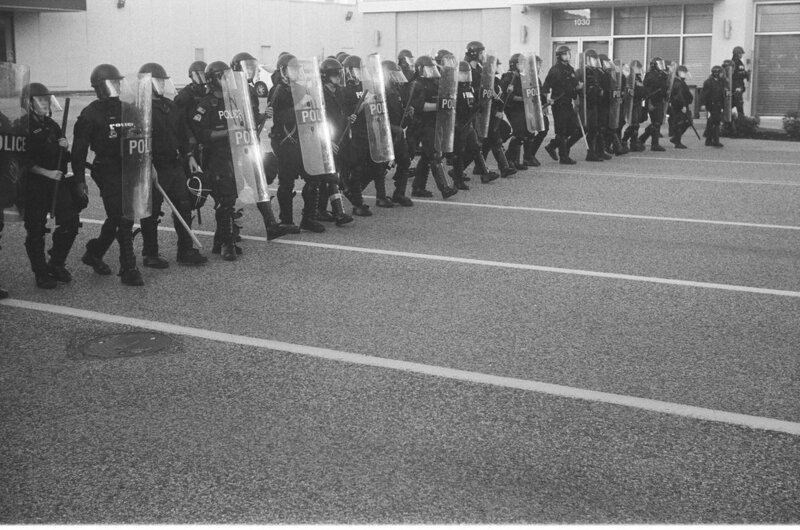 Marching in front of the police headquarters. Police officers stand on an island. A demonstrator shakes hands with a police officer. This man is at every protest and is always at the front lines, according to Sibic. 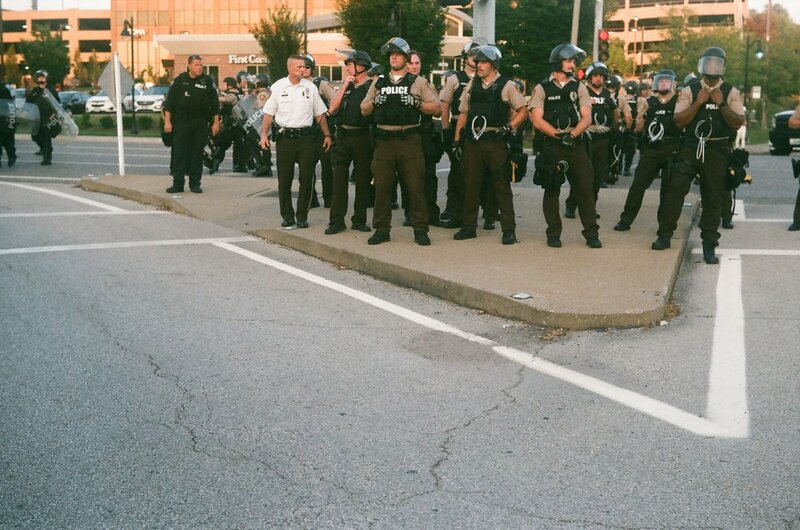 A line of police officers in St. Louis head toward the bus. 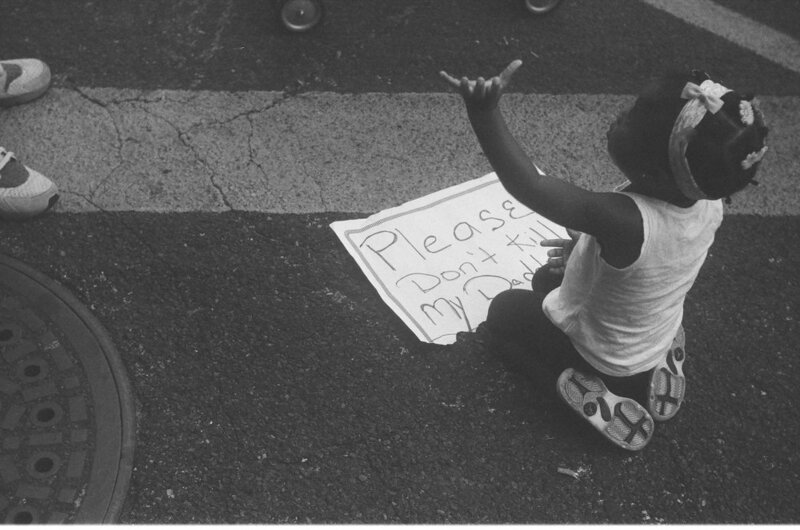 A child demonstrator with a sign. A child involved in the demonstrations stays hydrated. 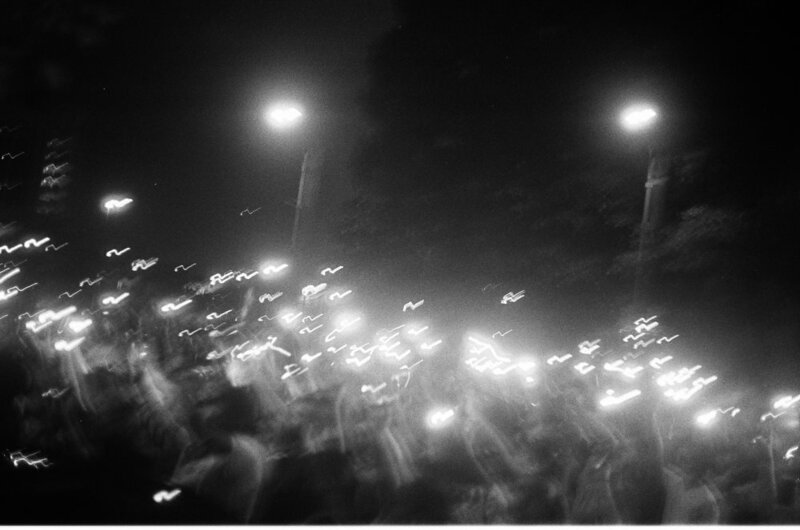 The moment the march reached the intersection being held in front of the police headquarters. When the protesters are in large numbers, some are tasked to hold an intersection while others march. Two flags seen at every protest. A man with an upside-down flag frequents the protests. In Clayton MO, somebody holds a sign in front of where police officers had blocked the street where protesters marched. Many protestors spoke with this officer throughout the march in Clayton, MO, a business neighborhood of St. Louis. 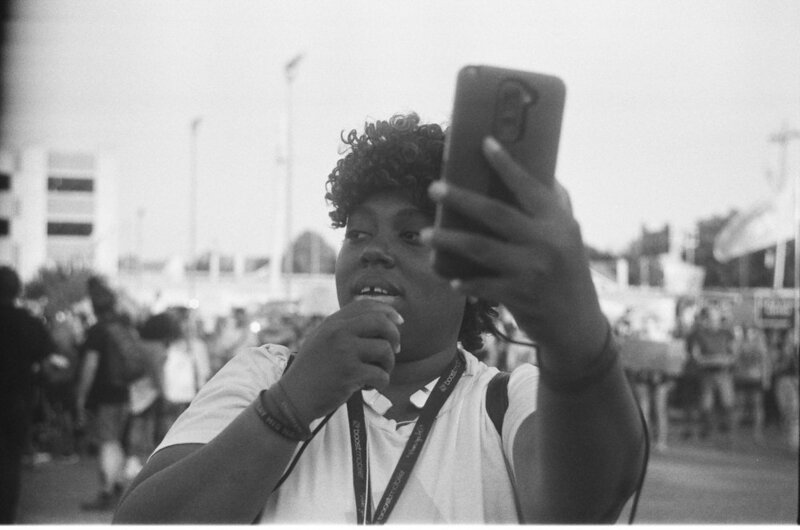 One of the Black Lives Matter organizers addressed a crowd in the Galleria Mall parking lot. This man appears in several of Sibic's photos. He is at every protest according to the photographer. He is pictured here in front of the Galleria mall. A sign that appears in waves at most every demonstration. Organizer addresses the crowd holding an intersection in front of the Galleria mall. Drums are a huge part of the protests. The drummers keep rhythm with the chants and generally add to the overall noise disruption of the protests. Protestors in front of the Justice Center on Market Street show solidarity with their flashlights on their phone. Keeping the rythm of the march. Police officers assemble a line from both sides of the street to corral and disperse protesters. 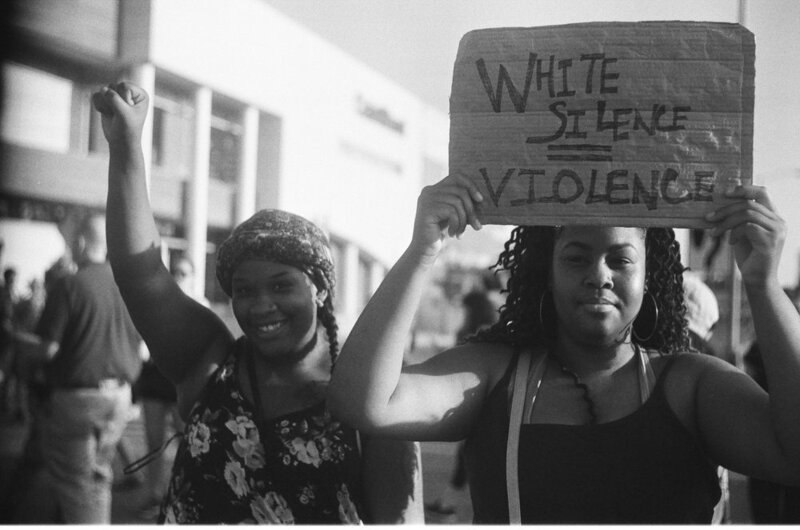 This forced demonstrators back into the Galleria mall parking lot, according to the photographer. 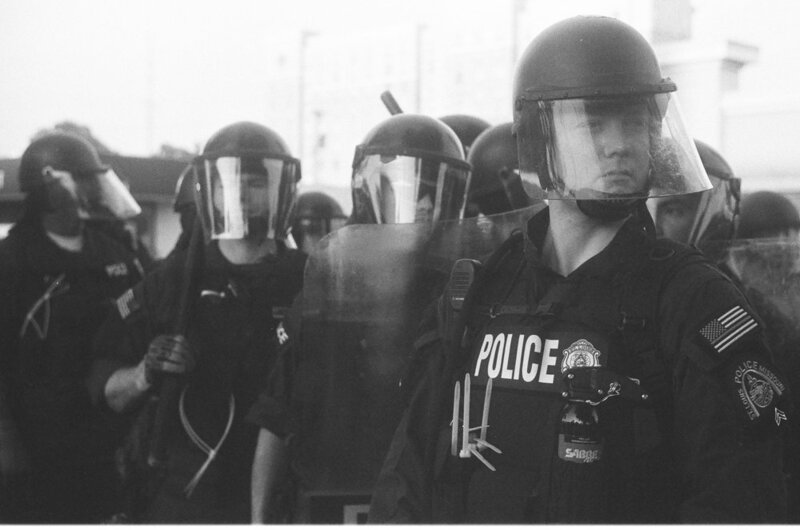 A police officer stands behind a shield. Contact Adem by email at ademsibic.as@gmail.com. Follow him on Instagram at @adem.sibic.